I'm going to take stock of my blessings and tell you what I'm thankful for. It always puts things in perspective. I'm thankful for a pair of shoes that really feel good on my feet; I like my shoes. 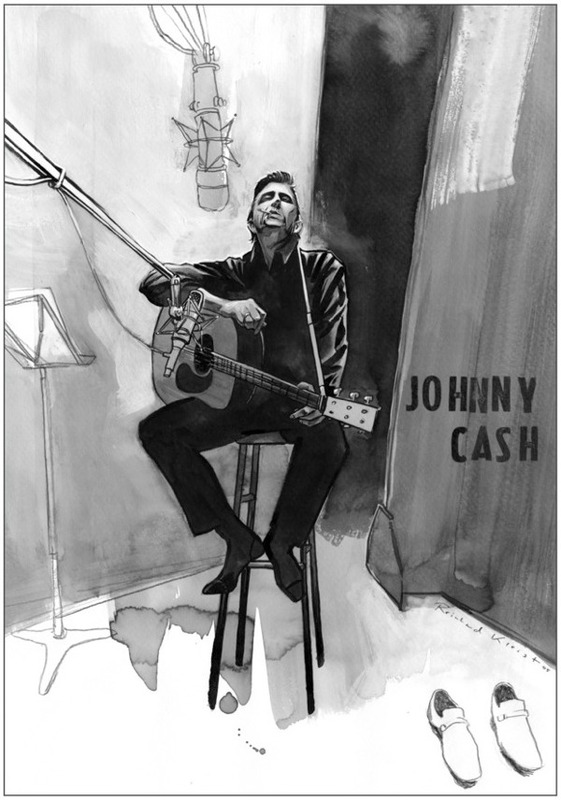 Many Johnny Cash fans remember the 1981 ACME commercial ad (ACME. 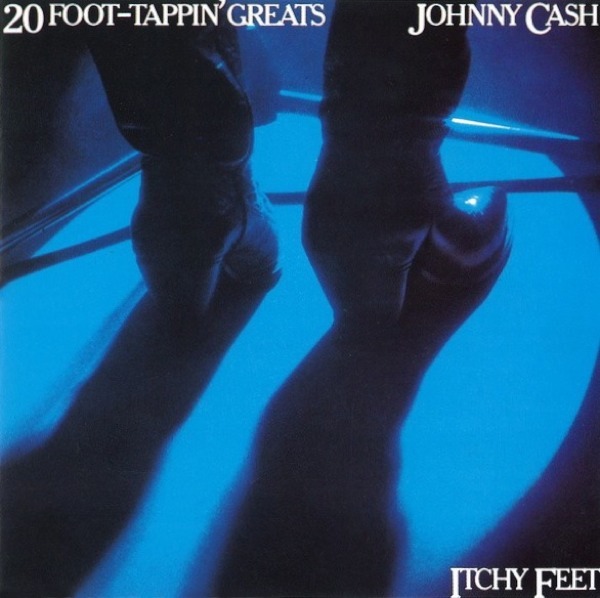 The first name in boots that last), still when it came to shoes and boots the Man In Black was a made to order kind of guy. 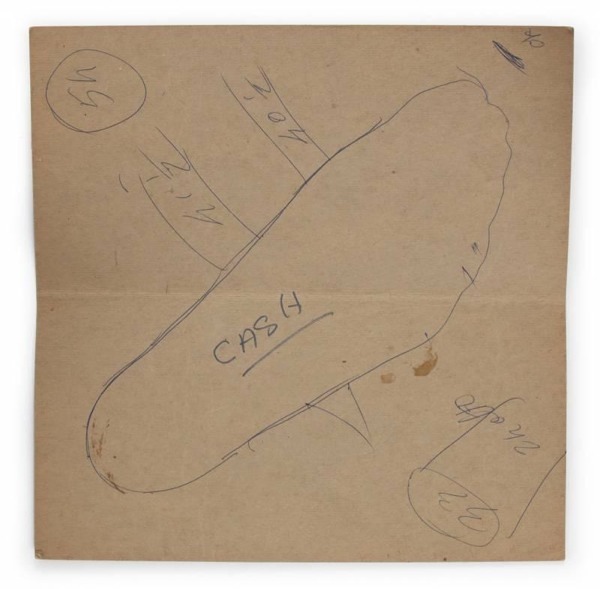 A shoe mold made for Johnny Cash by Di Fabrizio [See below]. 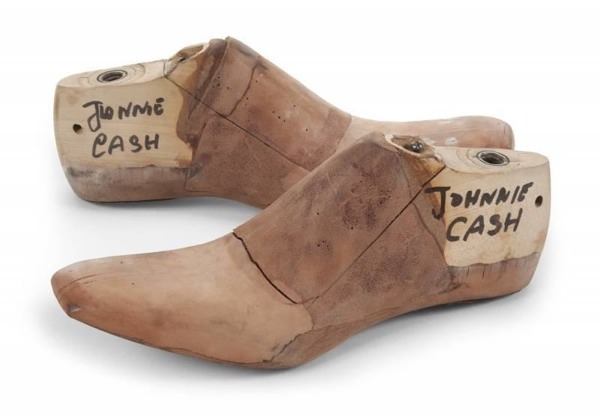 The molds, labeled “Johnnie Cash” in black marker, are made of wood and leather with a metal heel plate. The shoebox that holds the molds has a grosgrain ribbon in the colors of the Italian flag on the box top and an adhesive label that reads “Johnnie Cash.” Accompanied by a cardboard pattern. 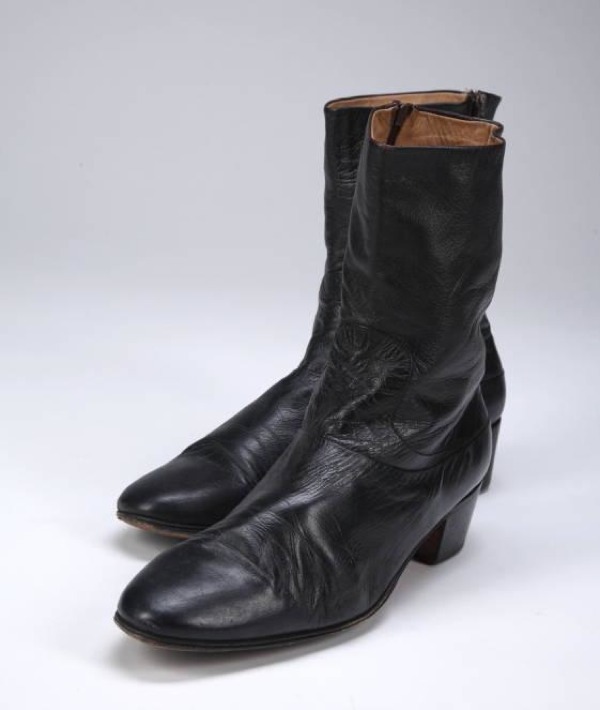 A Johnny Cash owned and worn pair of black leather Moreschi ankle boots, signed by Cash on the interior of both boots in black ink. 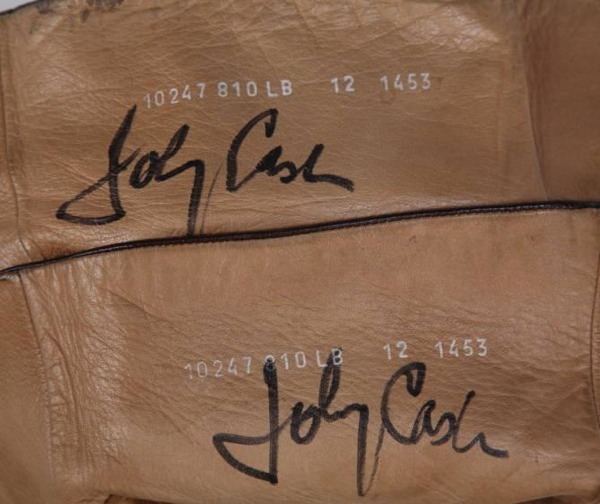 A pair of Johnny Cash stage worn and signed shoes. 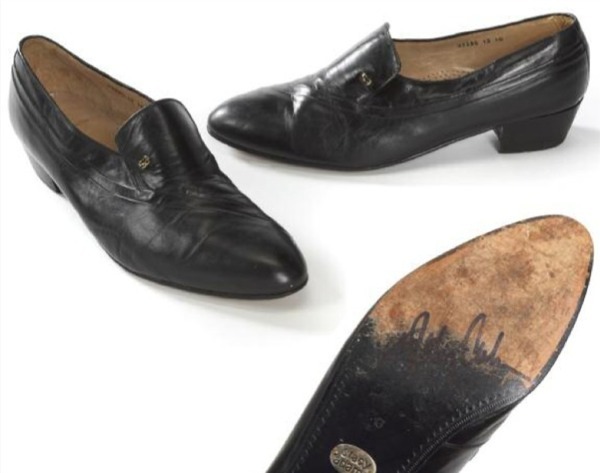 The black leather Stacy Adams brand shoes are signed on the right sole "Johnny Cash". They were worn on stage in the mid-1990s. Size 13. 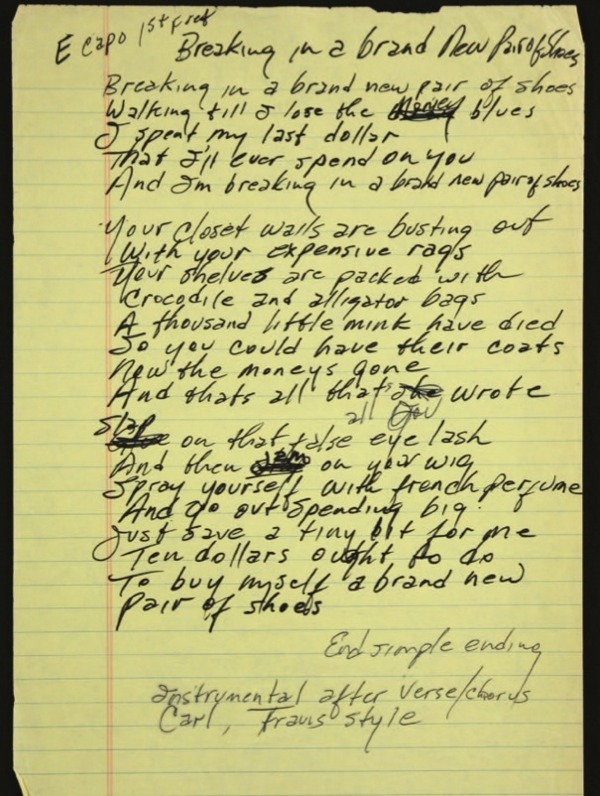 A sheet of Johnny Cash handwritten working lyrics to a song titled "Breaking In A Brand New Pair Os Shoes" written on a lined sheet of yellow paper in two types of black ink. 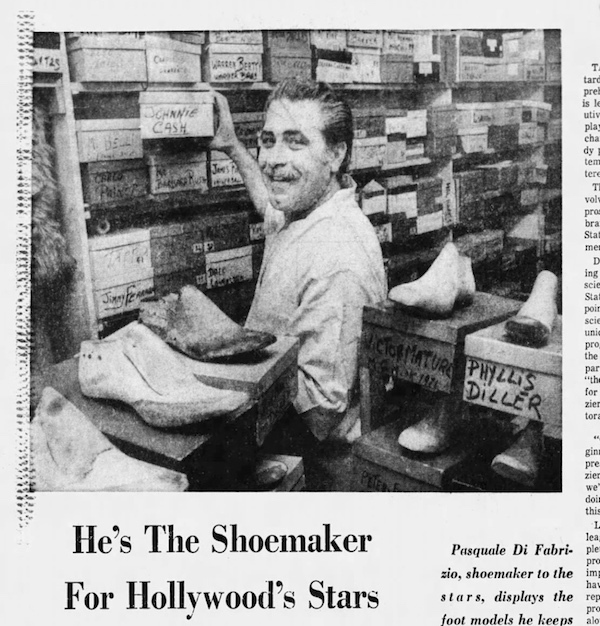 Pasquale Di Fabrizio (1926 - 2008) was a legendary shoemaker in Los Angeles, a modern day shoemaker to the stars. His shoes do more than look good, they can work wonders, like make an actor look taller. "To tell all the secrets would take a month," Di Fabrizio says with a chuckle at his shop in Los Angeles. "This is an art that every day dies," he says. An art that requires knowledge not only of foot anatomy, circulation and balance but also of the nuances of period fashion. "The shoes have to be 100% the truth of the time," he says. He was born in Pratola Serra a small town nearby Avellino; he left for the U.S.A. in 1961 and never came back but at the same time he kept a strong relationship with his hometown. He was appointed Cavaliere dell'ordine della Stella d'Italia by the Italian Government in 1971 and "Man Of The Year" in 1997 by the Federated Italo-Americans. In what can loosely be called "shoe circles," Pasquale Fabrizio is a minor deity. Not only can he take the squeak out of a pair of boots, he can put the squeak back in. He can dye a favorite pair of shoes cream for a wedding day, then return them to a pristine black. 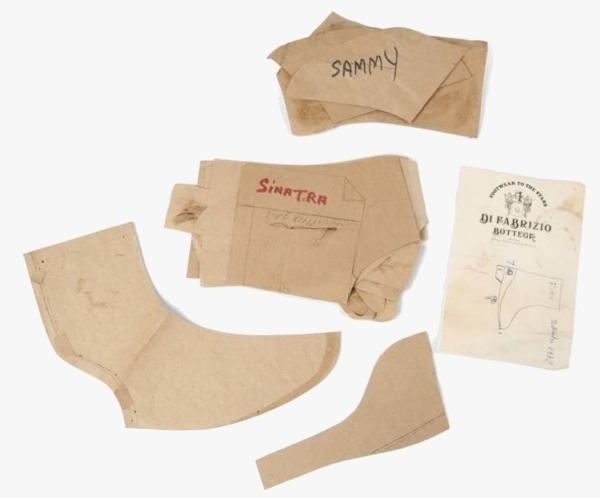 When Dorothy's ruby slippers from "The Wizard of Oz" needed a touch­up, the Smithsonian Institution sent them to Fabrizio. In an armored car. Shoe lovers of every age, race and income travel unfamiliar swaths of Los Angeles to see the master cobbler. He passed away in Burbank July 15, 2008 and lay to rest at Forest Lawn Memorial Park, Hollywood Hills.